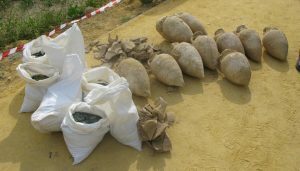 On the morning of 27 April, during maintenance works in a pipeline that runs underneath El Zaudín municipal park, in Tomares (Seville), the workmen realised that the JCB was digging through a cluster of large ceramic containers. Upon realising that these containers were full of coins, they decided to extract them systematically and to call the archaeological service (DelegaciónTerritorial de Cultura de Sevilla, Junta de Andalucía). 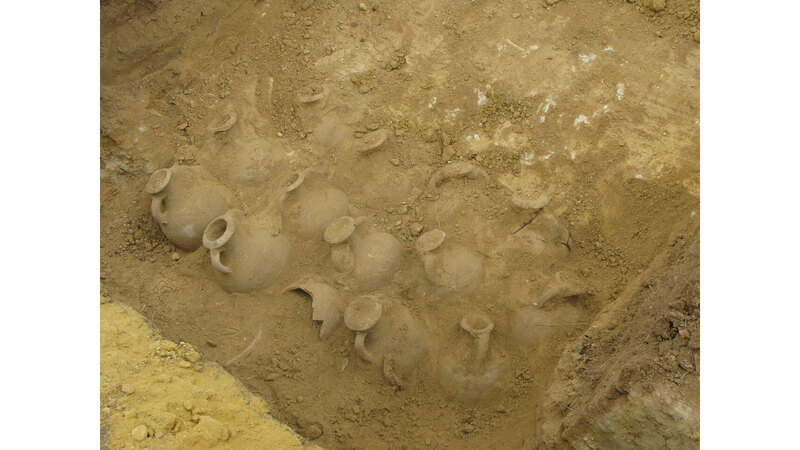 The find comprised a total of 19 amphorae, 10 of which were broken as a consequence of the machine work. The other 9 were complete and remained sealed. 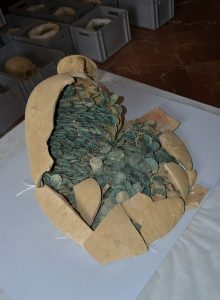 Each group of coins was immediately grouped with the pieces of the corresponding amphora, in order to avoid them getting mixed up, and the entire assemblage was taken to the provincial archaeological museum in Seville for security reasons. These amphorae belong to the well-known Dressel 23 type, which was generally used for the transportation and storage of olive oil. They were manufactured in the Baetica for commercial purposes, as demonstrated by their discovery all over the empire. Their chronology spans the last decade of the 3rd century and the second half of the 4th century, although their use could have persisted somewhat beyond this final date. Tomares is located along the lower course of the Guadalquivir River, very close to Seville, in the hilly area known as the Aljarafe; the terraces of the Aljarafe, which overlooked the former Betis estuary –lacus-ligustinus – were important areas of human habitation throughout prehistory and antiquity, including the Roman period. The area had important riverine and sea connections, and was also traversed by important roads such as the via-Augusta, which ran through nearby Hispalis-towards the north and Emerita Augusta. Of special interest are the Aljarafe’s connections with the mining region of Riotinto and the hills of Huelva via-Itucci-and-Ilipa. This strategic position was attested by the location of the Phoenician sanctuary of El Carambolo, where a famous hoard (also in the Seville museum) composed of pieces of gold jewellery was found. Later, PubliusCornelius Scipio settled his veterans in Italica – the birthplace of Trajan and Hadrian – which was founded on the edge of the lower terrace, near the river, in 206 BC.On the other side of the river, the ancient city of Hispalis, modern Seville, was bestowed in the Augustan period with a new status as Colonia Romula-Hispalis, an important harbour and the centre of intense commercial dealings which distributed the region’s products all over the empire. The discovery of these coin-filled amphorae prompts a series of very interesting questions. Previous research had confirmed the presence of an agricultural villa. A geophysical survey carried out in the area where the coins were found has detected the presence of structural remains, the function of which will hopefully be determined in the future excavation of the area. The archaeological wealth of the area appears to reflect the economic and social position of some of its former inhabitants, and although the epigraphic evidence is not abundant, one inscription found in Tomares (CILA II 589) mentions an important member of a senatorial family, Publius Mummius Sisenna, who was consul in 132 and presumably had property in the area. Concerning the coin hoard, it is still too early to say much, although its detailed analysis promises to yield interesting results. A cursory examination of some of the pieces has resulted in the identification of folles struck by Diocletian, Maximian and Maxentius and some from the early years of Constantine’s reign, up to the year 313. The coins appear to be acceptably well preserved and, after cleaning, it will be a straightforward matter to identify them. The state of preservation of a few examples is outstanding. This is, however, little more than guesswork, because only a limited number of coins have been examined as of yet, and definitive conclusions cannot be reached until the whole assemblage has been analysed. The first problem is to determine the exact number of coins in the hoard, given that the average weight of the amphorae is 35 kg. Moreover, it is still unclear whether the hoard includes coins that predate, or postdate the Tetrarchy. The latter would provide a closing date for the hoard and would raise interesting questions concerning the reasons behind the hoarding and, especially, the non-recovery of the coins. It is important to ascertain the most common date of issue among the coins of the assemblage, but it is also essential to determine whether any of the coins postdate the 318 reform or even date to as late as 330. The limited information available to date provides a tantalising glimpse of what the hoard includes, but more detailed conclusions are not possible yet: let us remember that in a similar hoard, in Misurata, different containers were filled with coins from different periods. It is, therefore, not prudent to proffer any conclusion concerning the closing date before the whole assemblage has been examined. The precise characterisation of the hoard of Tomares will have to wait until a larger number of coins have been examined. In addition, we are currently waiting for the tomography, which will, we hope, tell us more about the contents of the 9 amphorae that remain sealed. The hoard of Tomares is not completely exceptional, as similarly rich hoards from this period have been found elsewhere in the Empire. These hoards include pieces dating to the Tetrarchy and from later, into the 4th century and the reign of Constantine: for example, the afore mentioned hoard of Misurata, in North Africa. There is little doubt, at any rate, that this hoard will have its own peculiarities which will either confirm previous ideas or open new avenues of research. Tobeginwith, it is the largest hoard ever to have been found in the Diocesis Baetica and the whole of Hispania. This attests to the economic and strategic importance that Southern Spain and the Guadalquivir Valley still had in the Late Empire.